julie g. does not yet have a home page article. 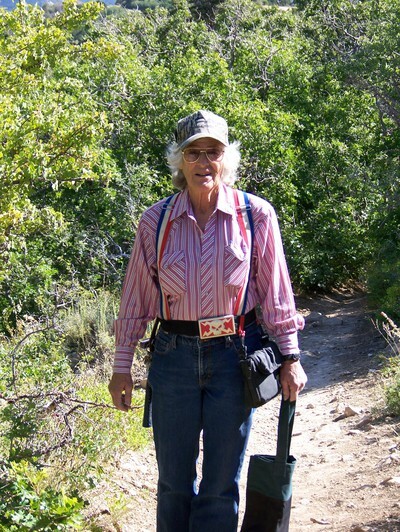 This page lists julie g.'s favourite minerals, localities and photos. All lists in alphabetical order. Volcanic rocks often cannot be classified by their mineral composition because the rock is finely crystallized or even made of volcanic glass. In these cases the volcanic rocks are classified by their chemical composition. 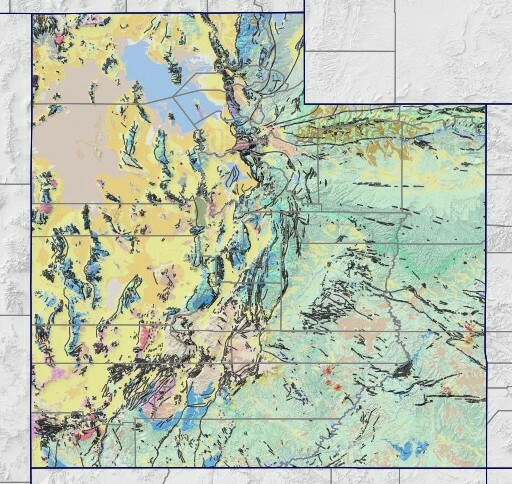 Within the IUGS classification of igneous rocks, this is done by determining the oxide composition of the rock and plotting the total of the alkali oxides (Na2O + K2O) against the total silica (SiO2) content in weight percent. The corresponding diagram is called "total alkali versus silica" or short TAS diagram. 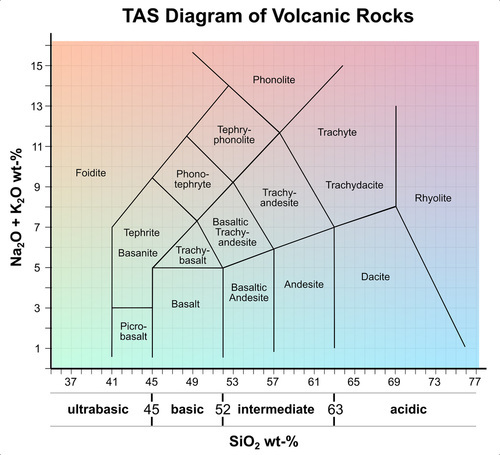 Below the diagram there is a "scale" that shows the boundaries between rocks that are called "ultrabasic", "basic", "intermediate" and "acidic". 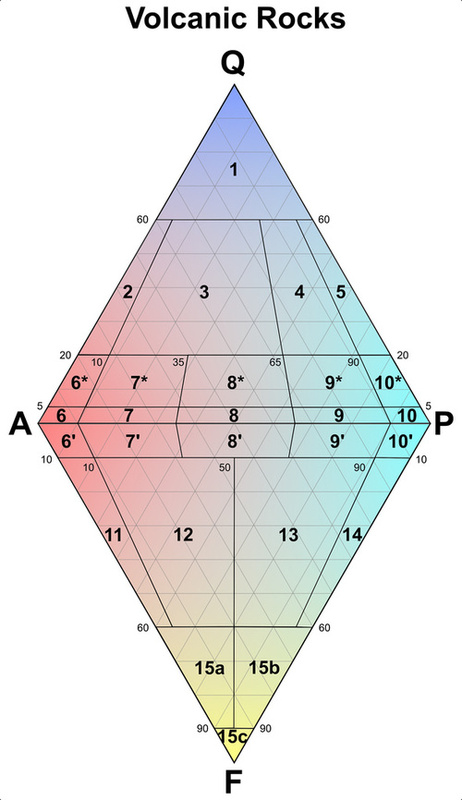 The diagram has been colorized to show the relation to the fields in the QAPF diagram. Le Bas, M.J., Le Maitre, R.W., Streckeisen, A., Zanettin, B. 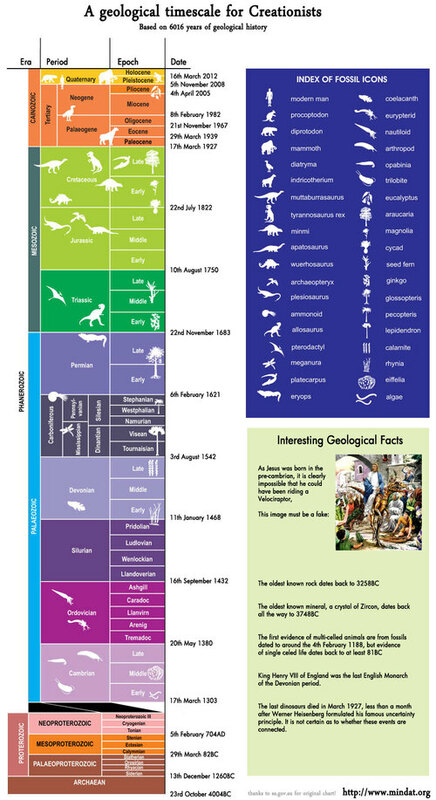 (1986) A chemical classification of volcanic rocks based on the total alkali-silica diagram. Journal of Petrology, 27, 745-750. QAPF volcanic rock definitions according to the IUGS recommendations for igneous rock classification. 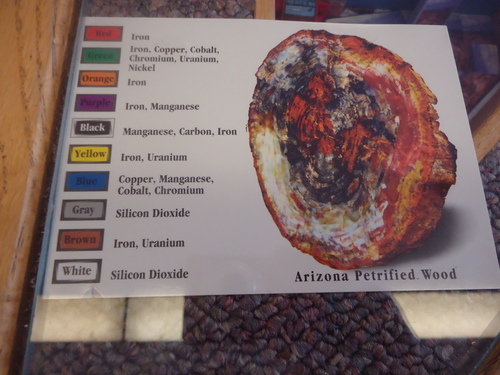 This is a poster showing what causes the colors in the famous petrified wood. This is a photo of a poster in the gift store in the park. It was not for sale. Taken 2-12-12. 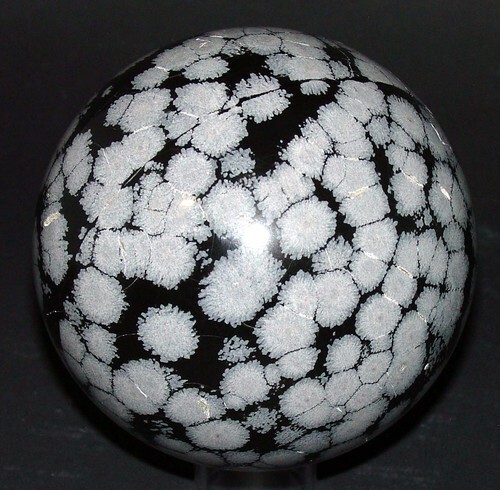 A sphere of snowflake obsidian over 7" in diameter. julie g. powell does not currently have any sponsored pages.